Genre: Fantasy, Betrayal, Dark, Adventure, Romance. All the things that go along with it. With the help of my dear friend, we have the beginnings of it and I'll update as much as possible to add new things. At the moment I'm keeping a Player Cap of 4, possibly 5. **Secret conversations or meetings will be carried out in PM with related parties and myself included. Don't worry. I keep all things secret. Until you say otherwise. This is strongly encouraged. The RP will come in installments of Books, each with their own agenda growing into a larger scheme of things. So be prepared for your characters to age and possibly die along the way. Who knows who could survive to the final Book? Plot(WIP) Book 1: The King of Illia is dying from a seemingly incurable disease. Illia borders the beautiful and enchanted land of Andalasia; separated by a mountain range in the north. The Kingdom of Andalasia is home to a Princess with renowned powers of healing and life-giving. The Illiad King has requested their help and out of the kindness of their hearts; The King and Queen of Andalasia sends the princess to his aide. But the Prince of Illia has other ideas. A large country to the north; filled with lush forests and plains, homing rare species of animal and plant life. The Capital City is where the King and Queen preside with their daughter. Made of spiraling white stone walls decorated by vines and flowers; it is a beauty to behold. The Kingdom itself is known for it's artisanal goods and beautiful women. They are an enormously rich country with no quells with bordering states. Unfortunately, they lack greatly in military strength. A sprawling country filled with townships and cities. Notorious for impoverished citizens and unfair practices. What they lack in monetary strength; they make up for in military. The Healing touch comes naturally to her and even activates automatically; things seem to grow stronger around her, people feel healthier and become stronger as well. When she is upset, nervous or afraid the life draining effect comes out and she has a much harder time controlling it, grass starts to wither and die. People she touches instead feel a sharp pain and long black veins spread from the area of contact. She is still growing with her powers and still learning what she can do with them. This makes her a target in more ways than one. Dragons: It's very possible to have small-sized dragons as pets. They are almost treated as any other common house pet: cats, dogs, etc. All tamed Dragons are required to wear enchanted collars around their neck to ensure they can't be used against the military or police force. Even the slightest hint of unruliness and both the Dragon and owner will be killed. Larger, rarer and expensive Dragons would be owned by the rich and noble. The largest and most vicious of their kind roam free far in the mountains. They are rarely spotted. Omega: Extraordinarily rare, one born every 100 years but it takes 500 years before it starts to mature to be more than a regular alpha. These Dragons can be a threat to an entire region of the world and have been said to unite all the kingdoms in a Continent to stop one should it rampage. Legends say there can never be anymore than three Omega Dragons at a time and also never any less. Alpha: Huge rare and powerful dragons that can grow to the size of castles, they are know to maintain nests where they are tended to by lesser dragons. Psi: When the common folk think of the legends of monstrous dragons that seek out towns to attack people and steal princess they are usually thinking of Psi class dragons. These are the large bus-car sized dragons that are extremely aggressive or dangerous. Beta: These are the non-aggressive and less dangerous dragons that grow to bus-car size. Gamma: While smaller than a Beta class dragon Gamma's can sometime be more dangerous, this is do to their dangerous abilities or aggressive nature. These dragons range in size from horses to human to big cats. Delta: These are the non-aggressive and less dangerous dragons to match the Gamma class in size. Epsilon: The size of dogs but aggressive or dangerous in their abilities, Epsilon are the most closely watched class of dragons. These dragon must be strictly trained and restrained by their owners as well as regularly brought in for weighing and measurements as any signs of growth could be taken as potential advancement to the next class and a perception of humans as "prey". This class is often used as guard or attack animals as while as in gladiatorial combat and dragon fighting, the public rarely take kindly to Epsilon class dragons in public places. Zeta: A more relaxed class in regulation than Epsilon's, Zeta's are still required to be weighed and measure though less regularly. These dragon types are known to be less aggressive or dangerous to people and widely accepted as pets. Mu ~ : Cat sized dragons of any type. Iota: Baby dragons of any type or miniature dragons that remain the size of large lizards. Metal: A rare breed that usually grows to a psi category size, they have metal like jagged skin. Able to travel rolled up wheel like, they have razor sharp wings that can cut down things on either side of it as they roll but they are too heavy to fly. It can spew liquid metal that hardens and seals things inside a dense metal coating. Air: Air dragons are very light and ribbon like and from its hatching to it's death, they can fly and never have to land. These dragons may also walk on clouds, because of this combination Air Dragons are rarely ever seen or involved consistently in any human kingdoms. They hunt in packs, birds being thier favorite food. Will sometimes be seen swooping down for fish. Ice: A Gamma class long flat dragon that has long limbs and fingers. It attaches to its preys back and latches each limb onto the corresponding one and then has complete control over its actions. When it's attached, it slowly starts to steal away the victims body heat and in the end they become frozen statues cracking apart when forced to move, the dragon only leaves the prey if forced to flee from it or once it shatters completely. If tamed, it doesn't feed off of you and can be used as a way to fly and to protect you in ice armor. Only problem is; they are still very clingy and it takes coaxing for them to let go of you even if they are well trained. Light: Beta class dragon that has flat scales that are translucent and look like jagged glass. With a long neck and beaklike snout. Opalescent eyes (so pearly like). Serene creatures that like to spend most of the day napping in the sunlight; has an affinity for shiny objects and mirrors. Sometimes described as vain because they get stuck watching their reflection for hours. It has two main defenses, it's breath weapon which is a blast of shadows it isn't dangerous directly but leaves enemies blind, the amount of time they are blinded depends on the class/size of the dragon; and it's own natural magic to create an illusion around itself either to disappear or assume another form. It has wings but when it flaps them all that is seen is a flash of light where is disappears and reappears, in reality it flaps once and moves as light at light speed to appear wherever it wants to go. Shadow: Same descripstion as above with key differences: It is jet-black with deep ruby eyes. It absorbs light and uses it to shoot out concentrated beams. They travel by shadow and can easily shapeshift into shilouettes or its own preys shadow to confuse it. Untrainable and extremly dangerous. Psi class. Earth: Earth Dragons are amazing burrowers they usually are Psi class and the common nickname for them in human regions is land sharks, because of their voracious appetite and the speed way they move through the ground. They are very aggressive and eat almost anything, when one ends up in human territories or a clutch of eggs hatch near civilization there is usually a heavy bounty offered by the local lord to kill them before they do too much damage. Kings and Lords often mount the beasts for display and use them as bragging rights between them. Stone: Stone dragons being mostly like regular classical western dragons but it's main weapon is it's glare. The stare of these dragon cans paralyze others and given enough focus even turn flesh to stone; they spew acid specifically meant to melt the stone that their gaze produces which they then eat. Hybrids of this dragon are often call basilisks and have the same ability to petrify prey and eat the stone. Life:Life dragons like to stay by ancient temples and ruins, the more dense untouched areas of the forest. They are also classical eastern but can be golden or green. They trail orbs of light and make a small "jingling or twinkling" noise when they fly.Playful by nature. They are a calming sight and fills a person with love and happiness. Beta class. Death:Since Death cannot be born, they are the souls of departed dragons. They can only be found in dead forests, abandoned villages and places of despair and death. They can be black, grey and wispy like cobwebs and tattered cloth. They look more like eastern dragons that fly without wings. They make a "hushing" sound when they fly. Causes voices in your head and a sense of overwhelming doom. Can range from Gamma to Alpha class. Chimeras: Dragons are pretty virile. Creatures born from cross-breeding or magical experimentations. Unicorn(s): It is believed there is only one in existence and it resides somewhere in the forests of Andalasia. One hasn't been sighted in 100 years. All parts of the Unicorn are considered magical and with great benefits such as : prolonged life, beauty, vigor, intelligence, and the ability to cheat death. Expect things like Direwolves, Giant Bears, Banshees, Kelpies, Pixies, Fairies etc. They are not abundant but can be found in places like Andalasia; it is uncommon to see one but not rare. Magick- All people have magic within them but was lost when they severed the connections to The Ancient Alvari. Old Gods of Wisdom, Nature and Beauty that once owned the religion in these lands. It is rarely practiced outside of Andalasia and even then, is not as powerful as it once was. It is a dying religion, even Andalasians seem to be leaving it behind. Magic is defined by elements: Fire, Water, Earth, Air, Stone, Metal, Lightning etc. With the two rarest kinds being Life and Death magick. Most magic users will have to use physical objects for incantations and such. Your magick must be channeled through an object ex. Wands, Staff, bracers, bracelets, rings etc. Make it known from where the concentrated magick comes from. 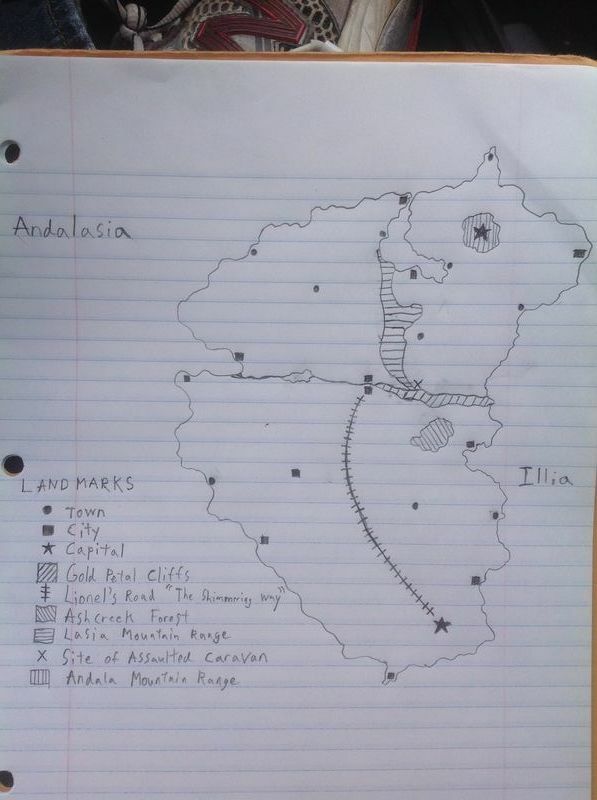 Andalasia: The country is a natural amplifier for all magical abilities, the land still soaked in Ways of Old. Illia: Natural magicks falter here; The Ancient Alvari cannot bless this place. Conjuring is still possible. Battle/War Magic: Can be applied to armor, weapons, talismans, warriors and the like. Illians have increased power in: Fire, Metal and various types of Black Magick. Science- A small budding group following The Ancient Alvari. Sparse throughout the land; they listen to the teachings of Wisdom. They believe that the future lies within the advancement of technology. Looked down upon as lunatics. Military- Each Country has it's own defining force. Illia is the leading country in warfare and militia strength. They worship the Gods of War, Victory and Prosperity. Book 1. Your character will age with the books, so plan it accordingly. The Princess starts at age 16. Think fantasy, medieval stories and such. You can be a commoner with evil intentions, a knight, a mage or cleric. You can be a Dragon Tamer and Breeder or a Creature Hunter focused on hunting down mythical beasts for money.Or a slave dedicated to revenge or sleeping their way to the top. Beware though, your actions may have unforeseen consequences. Description: (15) A young thin peach colored girl with long red hair braided down her back intricately. Large frosty blue eyes that sparkle with wonder at most things and an elegantly tall build. Personality: Very caring and curious. She is sweet and too naive for her own good and rarely passes harsh judgment. She has a strong sense of right and wrong but hasn't experienced the world before. Weapon/Equipment: She never learned how to use weapons or at least no one took it serious enough to teach her. She has the rare ability of channeling her magick through her skin. Powers(if any): The Healing touch comes naturally to her and even activates automatically; things seem to grow stronger around her, people feel healthier and become stronger as well. When she is upset, nervous or afraid the life draining effect comes out and she has a much harder time controlling it, grass starts to wither and die. People she touches instead feel a sharp pain and long black veins spread from the area of contact. She is still growing with her powers and still learning what she can do with them. This makes her a target in more ways than one. Appearance: Light tanned skin marred with some scars. Caramel eyes full of mischief and brown hair tied into a messy ponytail. She chooses to forgo dresses and the like in favor of slacks. Wears leather bracers on her arms and fur wrapped boots. Personality: A tough brash young woman, that has a keen sense to get into trouble. She likes to run with the best of the boys and not one to give in to frailty. Tulla gets into trouble more then she means to, has a knack for taking things that aren't hers and loves to travel. She's an adventurer and would never back down from the prospect of treasure. Tulla can be forward, trusting the beasts she hunts more than the people she hunts with. She is protective of Whisper; she wouldn't hesitate to kill if it ensured her safety. Bio: Tullalily was bought at a young age as a companion for Whisper. She grew up along the young princess acting as an older sister. She knows nothing of her birthparents and chooses not to seek them out. She trained young with the Beast Keepers in Andalasia; picking up the love for the trade. Tulla also serves as a personal guard to Whisper, more so because they are like sisters. Weapon/Equipment: Carries a hunting knife in her belt but more keen to setting booby-traps. She travels with an array of different knives, used for hunting and skinning. Powers(if any): She was born without magick and prefers it stays that way. Description: Fairly average height with a sturdy build, shaggy red hair, green eyes, general warm and friendly features. Being a traveller, he generally looks rather unkempt. Personality: A carefree individual, generally very friendly and outgoing. He's known to be a somewhat roguish sort, and some people don't trust him much as a result. That said, he rarely actually does anything bad, and is a genuinely nice guy for the most part. He can have a temper sometimes, though, and he isn't the type to back down from a fight. Loves to drink and flirt with women. Even more than that, he loves to travel and explore all the forgotten places of the world. Bio: Born and raised in a small village in Andalasia, Robert always knew he would end up leaving to travel one day. He had a relatively nice childhood, save for his tendency to get into trouble. Eventually he learned to play a variety of instruments as well as sing, and he decided upon reaching adulthood to leave his village and became a wandering minstrel. It was around this time that he first became aware that there was something special about him. While it wasn't necessarily much, and usually went unnoticed, there was something magical about his music when he really put his feelings into it. Studying this, he eventually learned that it was indeed real magic, albeit a fairly small amount of it. However, he had little interest in pursuing this, and instead continued on his wandering life of wine, women and song. Allegiance: While he can be loyal, he has no interest in being tied down or forced to follow someone else's orders, and thus has no real allegiance. He lives his life for himself, and he likes it that way. Weapon/Equipment: A walking stick he sometimes wields as a weapon, as well as a hunting knife and a bow. The bow and knife are only tools for hunting and such. He doesn't fight to kill, and generally doesn't fight at all if he doesn't have to. Powers(if any): Bardic magic. He can inspire people to accomplish things beyond what they're normally capable of with his music, or he can use it to stir various emotions in people. He also has some minor skill with illusions. Description: Zaddion is bearing of a slightly frail but otherwise average set of physical proportions, one can likely tell that he is not used to physical work. His eyes and hair have adopted a very pale grey colour on account of the magickal experiments he conducted upon himself. His skin is mostly fair but is also adorned with a very crystalline tattoo that wisps across his hands and forearms onto his upper torso. Personality: Being a budding mage, Zaddion can appear odd to more common folk, his connection to the elements often gives him a very mystical nature, especially when it comes to the cycles of day and night. Ambitious and intelligent, he possesses an obsession with Magick that is rarely seen in the modern world, even among his fellows from Andalasia, some may even consider his obsession unhealthy to the point of minor insanity. Being one to learn from his tomes for "fun," rather than interact with others it comes as no surprise that Zaddion is absolutely terrible with people, thankfully his serious and often very cold nature prevents him from speaking unless he is required to. He bears an obsessive curiosity with the world around him as it may aid in his never satiated hunger for knowledge in the realms of Magick. Robes of Twilight - Black and White robes bearing a few mystical runes, while these do not have too much effect physically it not only works as a symbol of status but also for a minor conduit for the Magicks of Light and Shadow. Tome of Day - A white and crystalline tome bearing all of the information Zaddion has gained about the element of Light. Tome of Night - A black and twisted tome bearing all the information Zaddion has gained about the element of Shadow. Mark of the Pinnacle - In an attempt to learn more of Magick, Zaddion embedded his flesh with a host of crystals that form a tattoo. These crystals act as powerful conduits for Light or Shadow and change colour from white to black depending on the saturation of these elements. This tattoo may be used to channel spells only from these two elements. Unfortunately, use of the crystals cause them to vibrate slightly, Zaddion may find himself the victim of mass bleeding if he uses these crystals too often in a short space of time. Staff of the Aethyr - A simple wooden staff bound with runes and a crystalline head, this staff may be used to channel any elements, although unlike the Mark of the Pinnacle it may not channel more than one element at once. Powers: As a fully fledged mage Zaddion possesses control over the elements beyond those who would merely dabble in the Magick arts, although the increased power comes at the price of an ever looming peril not uncommon for mages who specialise in more than one element. He particularly focuses on the elements of Light and Shadow simply because these are the ones he feels most attuned to. Zaddion also possesses all of the basic powers that a true mage would be expected to wield. Personality: he is easy-going and very care free, he also is always smiling and able to find the bright side to things, he doesn't get mad or sad easily and when he is sad he still acts happy so his friends don't have to worry about him. he's also slow though no one knows if he is slow or acts like it, he is quick to lose focus though when he can, he can be very serious. He ran away at age 10 to travel around Andalasia helping anyone he can. Now at 17 he returns to the capital of Andalasia to rest for a bit before travelling once again. Allegiance: He has no allegiance to anyone, only people he cares for will have him fight by their side. Weapon/Equipment: Daggers, after raiding a bandit camp he learned he was better with daggers, he soon learn the way of fighting with speed and agility, he also has two hidden daggers on the bottom of his boots. Powers(if any): Water, but instead of using it in the classical way, like drowning your enemies, he uses it to give his attacks even greater burst of speed plus it really helps him out when he's thirsty. Description: A thin frail man covered with liver spots and dark brown bags hanging underneath his pale green eyes. His wispy white hair is crushed by the heavy weight of the gold crown he wears. Likes to wear heavy fur-trimmed robes to make him look bulkier and to shield him from the ever-present cold. Personality: He is prone to influence and sometimes to fits of madness. At this point in life his intentions are clear. Bio: Was a beloved King to his people until sickness took him and he became obsessed with finding the cure and increasing his lifespan. Weapon/Equipment: Keeps a sword by his side but relies on the protection of his gaurds. Powers(if any): None besides his personal gaurd. Occupation/Class: The son of the King. Description: This gentlemen puts you in mind of a cobra waiting to strike. He has two slanted eyes that are like two drops of oil; cold and unmoving. His silky, straight, black hair is waist-length and worn in a carefully crafted style. Roric has an elegent build with pale skin. He prefers a wardrobe of fine fabrics in shades of purple. Personality: A cold calculating stare and a demeanor of ice. Roric isn't easily approachable. He acts like a gentleman and easily charms women with his silver-tongue and wit. He has a sharp temper. Bio: The only child of the King (so they say); Roric was raised in wealth and finery. He soon grew an interest in magick; unfortunately, Dark Magick. When not socializing and attending events across the country, he spent most of his time in his chambers practicing poisons. As he grew, so did his lust for more power. And that meant taking Andalasia. Allegiance: To himself and his Kingdom. Weapon/Equipment: Silver tipped canines in his mouth and claw rings on his right middle finger and left pointer. He carries small flasks of different liquids on his person. Powers(if any): Poison crafting; including noxious gasses. Romeo Richards "Executioner Richards" "The Ragged Man"
Until recently he has served only as the court Executioner, but as the king grows weaker and more desperate his power in the court continues to grow. Romeo Richards is the opposite of Whisper and also a warning of what she could become. He is known in hushed conversation as the Ragged Man. This is because he covers his entire body in silken bandages, his magic is so powerful and wild that to be near him is to know absolute agony and anyone to touch his bare flesh dies instantly. For sometime he served as an assassin, before he failed his only mission in which he had been tasked with killing the king. The king however showed him kindness without knowing who he was and it touch Romeo so profoundly that a man so high above him would be kind that he confessed his sins to the king and turned on those that had hired him. In battle he uses an extremely powerful command of normal telekinetic magic, all the bandages covering him begin to unwind waving about his body like vicious snakes, they lash out wrapping around and restrain victims then drag them struggling and screaming for him to simply reach out and touch the target skin to skin. Castella Seret "The Iron Maiden"
Few people have ever known this mercenary's true name and even fewer of those people are still alive today. She is known to the world as The Iron Maiden and the world's most powerful metal magic user. She gets her nickname of The Iron Maiden from the armor she wears, it is women's armor with a helm made to look like a goddess' face and hair but the shocking feature of the armor is the ten to twenty swords that appear to be stabbed through it. She looks like a walking pin cushion and it's said that the swords are of warriors that got close enough to drive their swords into her only for it to have no effect on her become part of her armor; there are rumors that she isn't even human anymore that she's become warrior of living metal. This could be true as no one has seen her outside her armor in years. Castella as her band of warriors are well known servants of the kings and their mercenary group has been in his employ for years. More recently though with the king slipping slowly toward his grave Castella has decided to side with the future and now follows the Prince's commands. Description: Straw-blond hair which is roughly hewn to just shorter than shoulder length. He has tanned skin which is littered with scars, burns and is missing his left ring finger. At average hight and sporting a moderately imposing build - he is far from a bodybuilder but this is a guy who wanders the world hunting down other people. He has dark brown eyes and fairly chiseled - if slightly gaunt - features. Personality: Adrass is a Witch Hunter: one who hunts and destroys 'rogue' spell casters and for the most part, this defines his person. His actions are for the good of the world, as far as he is concerned. He is forceful both mentally and physically - unafraid to use threats and violence to get what he wants, should diplomacy seem to be failing. He understands that 'some Witches are worse than others' and is willing to overlook his duty to destroy them if it logically serves to help achieve a greater, more long-term goal. As with all hunters, he is one-hundred percent convinced that all magic is an evil to ultimately be destroyed sooner or later. He is overly serious about his work and is terrible at working as part of a group. He will do so, but even then tries to take control. He has trust issues and is paranoid - though it serves him well. He suspects everything of trying to kill him, and leaves nothing to chance. For all of this though, he is still human - subject to all the flaws of the human race. While strong willed (or stubborn, depending on your point of view) he is still subject to the whims and desires that any other person would be. Bio: Raised in an average homestead by an average family, Adrass was taken to live with the order at the age of nine. At the age of twelve he was formally inducted and began his training: setting out into the world at the age of twenty. During his time in the order of the Witch Hunters, Adrass was subject to intense propaganda and indoctrination of the 'evils' of magic, taught to fear and loath it above all else with a zeal unlike any other. He developed a deep seated mistrust of all things: not only magic but anything outside of his direct control. At the age of twenty one he completed his first hunt successfully. He has since slain numerous witches, of varying capability. He begrudgingly took on an apprentice at the age of twenty six: Arianna Blackbird. While reluctant at first, she proved a valuable tool in his investigations - leading to a deeper connection. They aren't exactly 'close', but the mutual respect between student and teacher is as strong as it ever will be. Arianna is currently completing her training at the age of nineteen, so that she may become a fully fledged hunter in her own right. Allegiance: Seeks to destroy spellcasters: everything else is flexible though he is aligned loosely with Illia. - Steel Longsword, worn on the back. - Steel Short-sword, worn on the back. - Leather Gauntlets with reinforced knuckles and brass studs. - Heavy leather longcoat with hood and light chain inlay. - Vial of 'Liquid Silver' oil, buckled to belt. - Vial of 'Alchemists Fire' oil, buckled to belt. - Four flintlock pistols (Early, single shot firearms), strapped across chest. - A pair of silver knives inscribed with magic-nullifying runes, hangs by his right hand side. These knives are designed as stabbing weapons, to cut off magical connections as long as they remain impaled in an enemy. Scent Enchantment - Years of hunting mages has developed the hunters senses in curious ways - magic can be sensed like a bad smell. It is difficult to pinpoint when weak or in a crowd, but given time to inspect an area, the hunter will eventually rout out the Witches foul stench. Deny - A subtle magic in its own right: repeated exposure to arcane energy hardens a Witch Hunters mind and body. While far from immune, they develop a natural resilience to magical assault - especially those effects which affect the mind. Description: Has back hair in a 'Pixie' cut*. She is tall and slim. Her eyes are the colour of honey, which may suggest warmth but beneath the surface, they are cold and calculating. She has a scar running down her left cheek. She normally wears light armor to make her body more streamlined. She wears a cloak either when it's cold or if she's planning to take something. Personality: She may be a cutie to look at but she is dangerous to get near. One wrong look and she'd have your guts for garters. She doesn't like it when people get all friendly with her because she really hates company and companionship. She does like looking at things from afar and would prefer to be by herself. Bio: She was orphaned at a rather young age, round about twelve, and not wanting anyone else to look after her, she took to the streets. She has been making a rather good name for herself, trading the goods she steals for trick arrows, regular arrows and food. When she was about thirteen, Helena finally taught herself how to scale walls and vault over things in her way. She taught herself parkour, basically. At about fifteen years of age, she discovered that she could make herself invisible and able to run at superfast speeds. Ever since discovering these powers, she has made an effort to efficiently steal while living on the streets. She has also made a makeshift home near the main military base, a very dangerous place to live near if your on the wrong side of the law but that's what she likes. Living dangerously. Allegiance: She swears allegiance only to herself. She may help others but it's mostly for her own gain rather than the person she's helping. Weapon/Equipment: She has a concealed mini-crossbow hidden under her cloak's left sleeve. She would use this to either fight back or to do something special with it. She also has trick arrows, such as a water arrow, to snuff out fires, a rope arrow to zip-line from rooftop to rooftop and a smoke arrow to leave the scene undetected. Powers(if any): She has the power to turn invisible at will and to run at near supersonic speeds. She has learnt to control her speed over time but she may get an extra burst of speed by accident on occasion. She uses these abilities to help herself flee the scene and to scare the regular populace. Her invisibility was mastered rather quickly. She uses this ability to help herself in fights along with the speed. It will come in an installment of books? Sounds interesting. What do we have to do to sign up? Also, why is it a WIP? There's alot more to add in because hopefully it will turn into a rich story. I'm still working on character sheets so they might be up either tonight or tomorrow, yo. Yeah, I'm planning at least. two more Books. this sounds awesome, incredibly awesome. I would love to sign up for this once its ready of course. I'll sign up once it's ready then. So as it turns out, I found this on my own. I'm definitely signing up once it's ready, and as always, feel free to ask me if you need any help or anything. Sorry, yo. I was gonna link you when it was all finished! No need to apologize. I just happened to look at your status. I'll tell you if I have any particular ideas, but I don't know how much I'll be able to come up with for you. I would definitely be willing to give this a go. After all I need to get back into the RP game, what could possibly be better than doing so with one of my favourite genres? Will the players interact closely? Will they be in a 'party' with a clearly defined goal, or acting independently and left to establish their own? I've got a whole cast of characters from a story I've been working on that sound like they could be translated to this world really easily. They will be in a party with a defined goal but can operate under their own agendas. Say for instance, a knight in the party. The main goal is to protect her, meanwhile he could influence her, become her friend, tell her lies to improve his own position or for money. Or if devilish enough, to ultimately gain the crown. Aha, excellent. I got that vibe (and was hoping i was correct) but wanted to be certain. I'd like to second that interest in the RP, and also the curiosity into how magic(k) will work in this world - I'm tempted to offer up one of the characters from my story 'Witch Hunter' you see. I'm working out the kinks of magic as we speak actually. So far we've worked out elemental types deciding on if your born with the natural talent, where your home country is and the Gods you follow. I'll make one when I get back from school. That should be in a few hours. I expect to have a sheet up late tonight, but I can't be sure. It might not be until late afternoon tomorrow. Aha! So its a natural affinity thing? You're born with it and so on? Well, here's a bit of background on the Witch Hunters in my 'verse. Bear in mind that I'd be adapting my character to fit with your world, so it might not fit 100% in this post... but it might give you a better idea of if you think one could be translated over. Living in an Empire which fears and shuns magic, it was only natural than an order would be built to solve the 'problem' of unsanctioned mages living in secrecy around the realm. The Witch Hunters were the final solution to this - appointed judge, jury and executioner to all things magical. The order was a colossal failure. It transpired that fighting those that wielded arcane arts was impossible, if one was to stay within the laws of the realm. This wasn't the end of the order though: they adapted. Officially, they were outlawed. A cunning move by the Grand Architect - the hunters were placed outside of his direct control, and outside of the protection and the benefits which that provided. They were given a single task: to purge 'evil' unsanctioned magic from the realm. Still recognised and respected (if feared and shunned) for what they were, they came to tread a fine line with the law - using a combination of fear, respect and status to escape the reach of the law when they overstepped it. As for fighting the occult? Witch Hunters are versatile: their entire lives are dedicated to Investigating, tracking down and killing Witches - in that order. They are often skilled combatants in their own right, and carry an assortment of advanced tools to assist them. Oils with unusual properties: knives, swords, nets and crossbows are commonly associated with the Hunters. More recently, a number have been witnessed wielding the recently developed flintlock pistols: though these loud, single shot weapons have failed to gain mass popularity over crossbows for the most part. Finally, more radical Witch Hunters have turned to a final, mistrusted option. A small number of them are born with magical blood themselves: and while years of suppression and indoctrination have left their magical growth stunted and locked away, those who dispose magic and seek to destroy it at any cost have been known to turn the enemies weapon against them. If Adrass is falls, or perhaps for other unseen circumstances, I may fill in a sheet to apply with Arianna - who is actually a 'witch' herself... though this isn't known publicly. Oh damn, its a bit long isn't it? I'll spoiler it! Bio: Zaddion was born as an only child to a relatively low ranking noble in one of Andalasia's larger cities, which one he was born in is no longer of any significance. At a young age Zaddion was found to have a natural affinity for Magick, even amongst the others born in Andalasia. As a result of his natural talent he was taken from his family to be given a proper education in the applications of the elements. Learning through intelligence and perseverance, Zaddion was found to have an obsession and interest in Magick far beyond what most would even consider healthy, he ignored these claims and quickly graduated from his initial lessons. Unfortunately, he was removed from the standard education program when he was caught infusing his own skin with Magick attunement crystals, resulting in him being deemed "unsafe." Of course Zaddion wasn't about to be locked up for insanity, using his affinity for Light and Shadow he escaped the clutches of he would-be captors. Now he wanders the libraries and Magickal places of the world, intent on proving himself not insane, instead wanting to be seen and respected as a Magickal genius. While he will often forsake or use relations for the sake of knowledge, Zaddion has a deep loyalty to the kingdom of Andalasia. Yeah, mages sense magic and other mages. They can feel the alignment and strength of the magick. Good, now that's out of the way I can get a fully fledged backstory written. I'll likely have it done pretty soon. I don't think Flying Ace has been added to the roster. I would love to join this but it seems that you have no spaces left, ah well, wish you the best of luck.